May Art Ribbon Design Team Call. I have 3 projects here for the call. First I have the Paper Crafts Official Gallery Idol Challenge the theme is washi tape or cloth tape! 1. I selected a A7 card base and covered it in 5 different strips of cloth tape. 2. Next I made a flower by sewing one side of the ribbon with a straight stitch and pulling it tight until I had the shape I wanted. Tied the ends of the thread together to hold. 3. 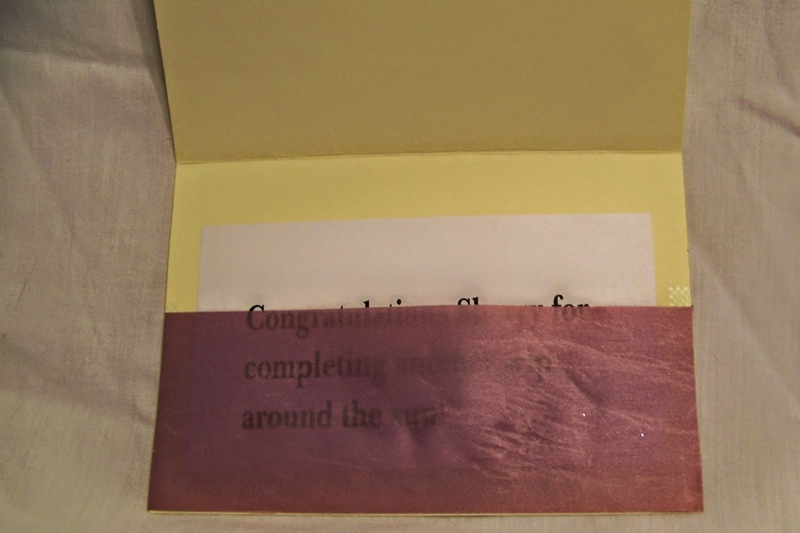 I used a large Glue Dots to adhere the flower onto the card. 4. I ran another ribbon thru the Oxyron 510 sticker maker and drew 2 parts of a butterfly by hand onto the ribbon. Next I cut out and placed the lower wing onto the card base. Last I cut out the top wing and squeeze the middle. I took extra care to place the middle and end of the top wing to the card. 5. Last I added the center of the flower and the wire feelers for the butterfly from my scraps. 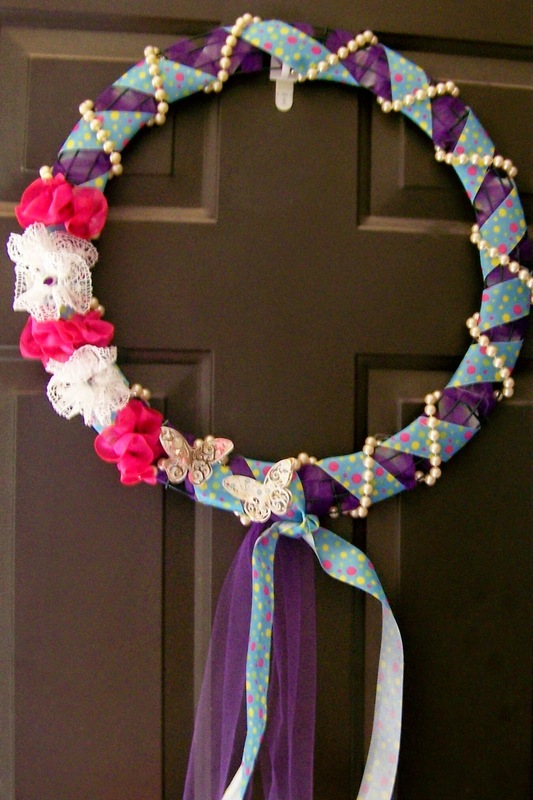 My second project is a summer wreath. 1. Starting with a wire base I wrapped purple netting ribbon around and thru the wreath. 2. Using Hobby Lobby poke-dot ribbon I wrapped it over the wreath and leaving some of the purple showing. 3. Next I used a string of pearls around the wreath. 4. With May Art ribbon I made the flowers by sewing one side of the ribbon with a straight stitch and pulling it tight until I had the shape I wanted. Tied the ends of the thread together to hold. With thin wire I added the flowers to the wreath. 5. For the butterflies I used Cricut Cartridge Art Philosophy <Bttrfly2> and Layer <Bttrfly2> to cut the gold and patterned card stock then layered and with Elmer's glue spots I adhered the butterfly to the wreath. 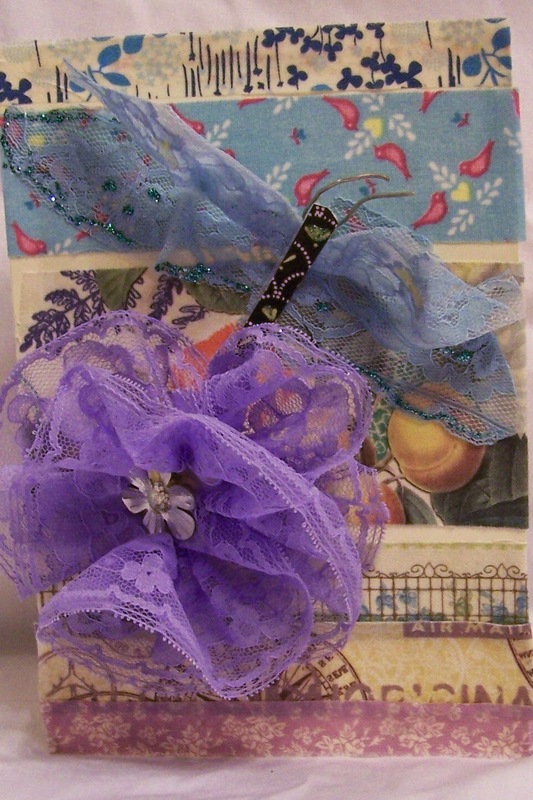 My last project is a card for my Grand Daughter. 1. I started with a A7 card base. And using gold and purple because it her collage colors. 2. From my stash I found the t-shirt hand cut die-cut that I added a purple ribbon to then adhered it to the base with Tombow tape runner. 3. 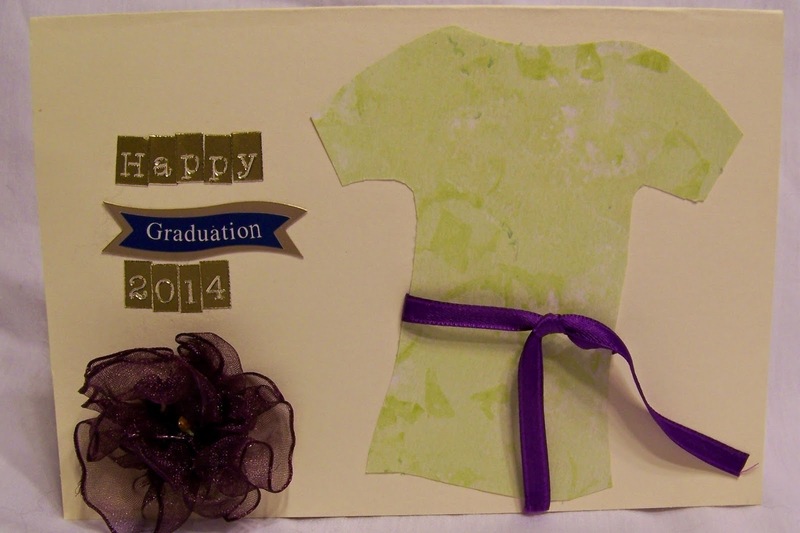 Also from my stash I found the embellishment for Graduation. With gold letters I put on Happy and 2014. 4. Again I made a flower. This time I used a wire edged ribbon and pulled one side into the shape I could use, tied the ends of the wire together to hold. With Elmer's glue spots I adhered the flower to the card. 5. Inside I cut a 2 1/2 inch ribbon to form a pocket. Adhered both sides and bottom with Tombow adhesive and placed it on the bottom edge. The pocket could hold a check, cash or like mine a note for the grad.